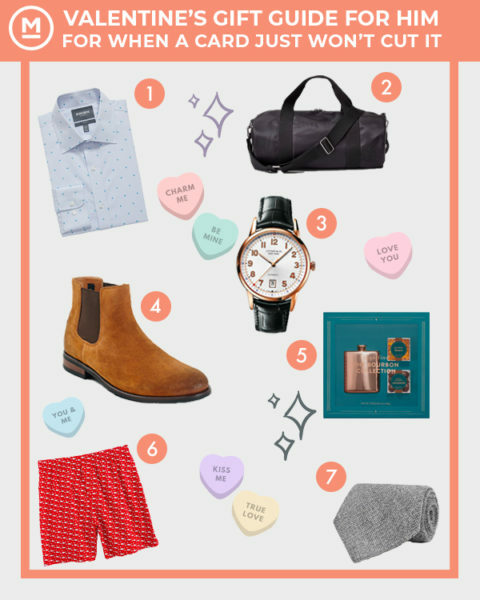 When a card just won’t cut it, Market Street is ready to help with a handsome (pun intended) selection of Valentine’s day gifts for your hunk. For the man who is always on the fly, a wrinkle-free shirt is the best way to look always look professional (whether at his desk, or for a last-minute date night with you). This practically perfect duffle bag is great for a weekend getaway, the gym, and is the perfect companion (aside from you, of course) for the on-the-go, head-turner in your life. When a card just won’t cut it, a classic watch never goes out of style. This incredible, 18k rose-gold watch is bound to put a smile on his lips when he sees it’s time to come home from work. This functional, yet dashing boot is something that he can (practically) wear anything with. These shoes are a great upgrade from a typical weekend-warrior pair of sneakers. Is your guy a little edgier than a stuffed bear can handle? Try getting your dapper dude some boozy gummies this season. These bourbon-infused caramels and gummy bears will put a top-shelf spring in his step. Have a whale of a time giving him these silly boxers; because these trunks are something fun but ultimately comfortable, soft and perfect for couch-lounging. Add a little texture to his daily commute! Pair Suit Supply tie with a Bonobos wrinkle-free shirt. Available in everything from wool to silk, a unique tie can be a fantastic addition to his work-look closet.